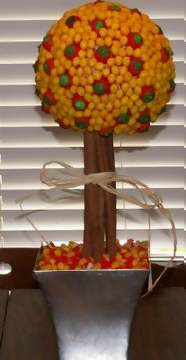 A Yummy Candy Topiary for Your Table Centerpiece! 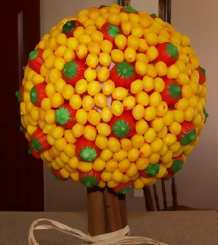 A fun candy topiary will draw lots of attention for your next baby shower or Halloween party. 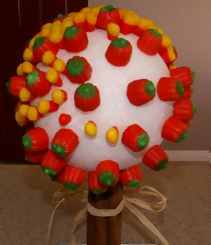 By using candy corn and other Halloween favorites, you can make a yummy bouquet for everyone to enjoy! 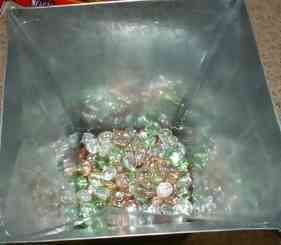 To start out, add your filler to the bottom of your container to add extra weight. The topiary will be top heavy if the base is does not have enough weight to equal out. I used decorative glass beads inside the pot, but you can use practically anything because it will be covered with the Styrofoam block. To make your candy bouquet topiary, shave your craft block to fit inside your container. 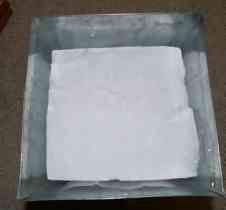 Leave about 1/2 at the top in-between the block and the lip of the container. 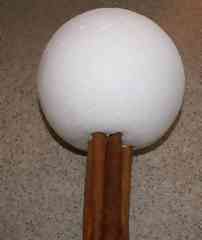 Using a knife or dowel rod, poke a hole about 1/2 deep into both the craft block and ball. Make it the approximate width of the cinnamon sticks when bundled together. This is where the cinnamon sticks will sit. 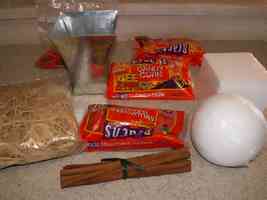 Place the cinnamon sticks into the hole you created in the ball and use your glue gun to secure it in place. Tie raffia or decorative ribbon around the bundle of cinnamon sticks. 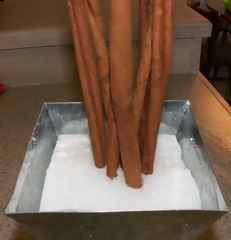 Place the cinnamon sticks in the craft block and glue it into place. 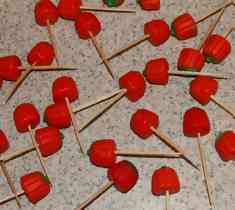 Push one toothpick through the bottom of a mellowcreme pumpkin candy. Repeat with the rest of the pumpkins. Now you are ready to decorate. Push the toothpicks and pumpkins into the craft ball, leaving spaces in between each pumpkin. Fill in the spaces in-between the pumpkins with candy corn. 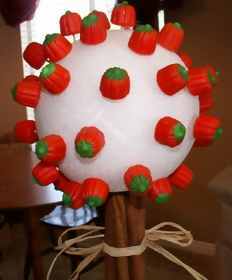 Push each candy corn, pointed side facing in, into the Styrofoam ball. Fill in the spaces of your bouquet until you can no longer see the ball. 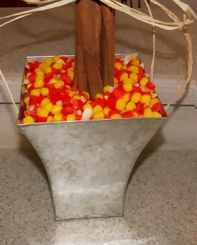 Fill the top of your container with candy corn or other Halloween candy. Here is a close up of the finished top of the topiary. Cinnamon sticks can be hard to find year round and in the correct length. Save yourself the hassle of trying to locate it by purchasing it on eBay for fairly cheap prices. If you are using a terracotta pot, paint 3 stripes on it to match the colors of the candy corn. Use Halloween or autumn ribbon to add a little fun to your topiary. If a candy corn breaks while trying to push it in...push another on in, close to the break and slant it to hide the broken piece. Good Luck with Your Candy Topiary!